NABSQNO 16S-470191-4105815. 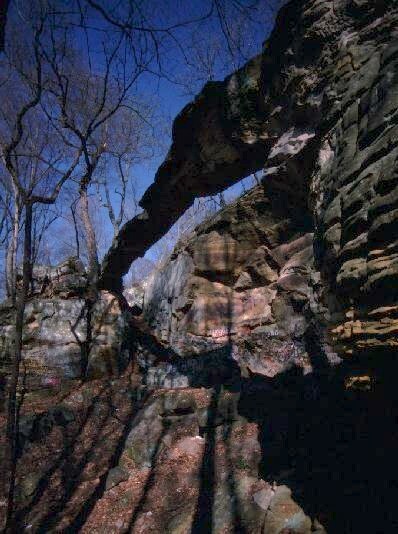 Apex Arch, also known as Rock Bridge, is an adult alcove natural arch. The lintel is well separated (22 feet) from the adjacent cliff, but the opening remains fully occluded. The arch is located about a third of a mile east-northeast of the small town of Apex, Kentucky, hence the name. Rock Bridge predates this name, but is a very over used name. Also, the arch is not a natural bridge. Thus, the newer name avoids confusion and is preferred. Apex Arch has a span of 64 feet, a height of about 30 feet, and a width and thickness of 3.5 feet. It is easily accessed by a short walk from a dirt road, starting about three tenths of a mile from the paved road through Apex.